dreaming and different thoughts are tabooed and further questions whether today's visible things are the absolute truth. The artist interprets some quiet movements detected in a boundary between dream and reality and/or perceived in a visually unnoticeable and unreachable place as prank of and sprites and paints such unrealistic storied combining with her daily experience in a picture diary like format. Having detailed brush stroke, deep colors and exquisite technique adopted from old Korean paintings, her figures reinterpret the beauty of traditional Korean painting with a contemporary perspective. In addition, her recent series of "Welcome" presents cultures of three countries, Korea, China and Japan thus boasts diversity and internationalist in terms of its subject matter and appeals to much diversified viewers. SHIN Sunmi graduated from Ulsan University and School of Hongik University both in Oriental painting. 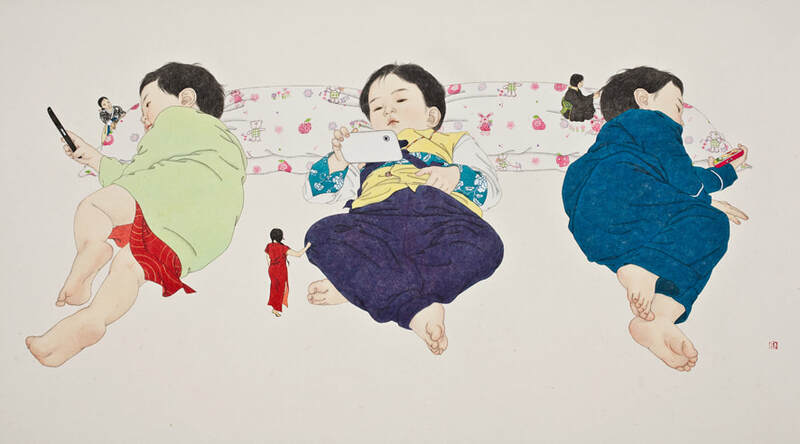 Since receiving an award at the 22nd Grand Art Exhibition of Korea by national Museum of Contemporary Art, Korea in 2003, the artist has been actively participating in bothnational and international exhibitions including Korea and Japan Exchange Exhibition (2007), KIAF (2008), and New York Scope Art Fair (2009). SHIN has been recognized for her unique style of combining traditional painting techniques with contemporary elements and is carving a place for her self in the art scene as she was chosen for Amore Pacific's artiest from SOAF Culture Economic in2004.